It is holiday time again and it is very important to be prepared for your holiday so that small incidents don’t ruin your holiday. 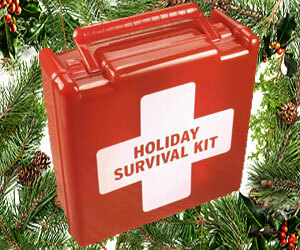 I have put together a holiday survival kit to ensure that you are prepared for all events. Take Probiotics everyday – they will fight any new bug that invades your digestive system. When you have diarrhoea remember to double the dosage. Your organs don’t go on holiday – they still work 24/7 and sometimes they work harder during the holiday because of overindulgence. So, please continue taking your supplements. A pressurised cabin in an aircraft is the perfect breeding ground for germs. Taking CordyMax-CS4 and/or G3 a nutient-rich beverage. To prevent fatigue during flight drink ample amounts of water and walk in the aircraft. If you travel by car also drink lots of water and stop every two hours to stretch legs and change drivers. Arnica 6C and Traumeel can help as a preventative for travel stiffness and Nux Vomica-Homaccord can help for drowsiness, indigestion and upset stomach. When you change time zones Melatonin tablets can reset the time clock and take it for a few nights till you are in a normal sleep rhythm. Aloe Vera and Tea Tree oil are wonderful natural remedies that you can use for all of the above. When you have bad sunburn add 3 cups of tomato juice with one cup of Sodium of Bicarbonate (baking soda) in a bath with lukewarm water and relax in the bath for healing. Citronella, cedar wood and eucalyptus can be used to prevent insect bites. 100mg of Vitamin B1 can also help. Traumeel and Arnica 6X are both remedies that will help for sprains and bruising. MSM tablets can be used for general pain. Use self- tanning lotion like Sunright Insta Glow Tanning Gel by NUSKIN for that tan look without the sun damage but if you really want to tan do it before 10 am and after 4pm when the sun’s harmful rays are low. Apply sun protection cream every hour and make sure it is SANCA accredited. Drink copious amounts of good quality water. Wear a hat and a pair of sunglasses with an UV coating to protect your eyes from corneal damage and cataracts and do not forget a lip balm with sun protection factor. Eat carrots, mango, spanspek, apricots – these fruits contain beta carotene and that will assist in protecting your skin. Recommended sunscreen: Nu Skin Sunright Lip Balm, Sunright 35 SPF and Sunright 50 SPF. The sun, wind, salt water and chlorine pools can damage your hair a lot. To prevent the damage, you can use shampoo and conditioners with SPF factors or coconut oil (apply to hair before sun exposure) and a hat or head scarf. Drink copious amounts of water when in the sun. Make the water interesting with mint leaves, slices of lemon or fruit slices and ice cubes to make cool. Coconut water is an excellent source of natural hydration solution if you are dehydrated. To purchase LifePak Nano, Overdrive, CordyMax-CS4, Sunright sunscreen protection, Sunright Insta Glow Tanning Gel and G3-Juice click HERE.